As I was wandering through the Harbourside Market in Bristol on Saturday on my way to the cinema, I was delighted to find a new stall selling sushi. I bought some for lunch, and it was so fresh and delicious – just what I needed! 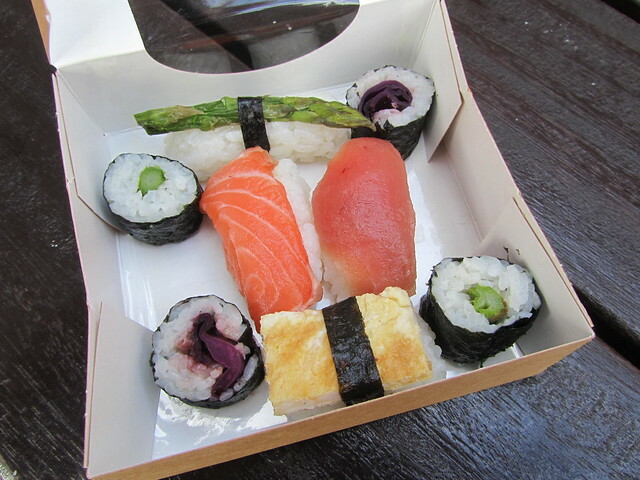 The box in the picture below only cost £4.50, and you could choose which pieces of sushi you wanted. Everything was kept refrigerated, and they used proper raw fish rather than any smoked salmon or anything (they explained this to me before I paid, just to make sure I was ok with eating raw fish – I wouldn’t have it any other way!). The people running the stall told me it was their first day, and they seemed super nice, so I said I’d give them a little shout out here on Haikugirl’s Japan. So, if you’re in Bristol on a Saturday and need a little sushi snack, head on down to the Harbourside Market and look for Unagi! They’ll be there every Saturday from 10am – 4pm. Thank you very much for your kind words Ali! It means a lot. We hope that you have enjoyed your sushi. Looking forward to seeing you again at the Habourside Market in Bristol.